Dr. Asad Rahmani, the Director of BNHS, spoke vehemently about the status of the vultures in the country and the need to conserve their last known abodes. It was the winter of 2005 in the workshop of the Indian Bird Conservation Network in Mollem, Goa. We listened with apt attention and focus to what he had to say. 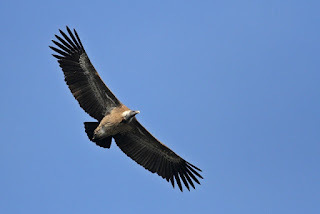 At the back of my mind, the image of vultures gliding over the Goa Meat Complex courtyard in Usgao was vivid and I understood why we did not see them anymore. A small intervention by man in the form of a veterinary drug-diclofenac-had spelt doom for these majestic masters of the skies. I and Pankaj had also documented a colony of nesting Long-billed Vultures (Gyps indicus) in the Chorla Ghat on the border of 3 states of Maharashtra, Goa and Karnataka. These vultures nested on the cliff from where the imposing twin-waterfalls of Vajrasakala cascaded down. The only vantage point to observe them was the opposite cliff way beyond the reach of any binocular or spotting-scope. The white dropping of the birds on the cliff rocks was the only evidence of their nesting. The only way to know for sure the number of active nests was to trek to the top of the waterfall and get a closer look. Finally the day arrived when I, Pankaj, Nitesh and Sanket decided to enter the gorge of the River Valvanti, the source of the twin waterfall. Early morning we set out for what was to be the toughest trek of my life and one in which we risked limbs and lives to get up & close to the nesting vultures. The entire trek was through the river bed, negotiating water pools, slippery rocks, steep slopes and deep gorges. Some were so tricky that a slip would end up with broken limbs and in a manner for nobody to help you. All this negotiating was done without any formal training of rock climbing or availability of gear. Our expedition was based on sheer resolve and the only encouragement was to count the number of active nests. Over 2 ½ hours of arduous trek brought us to the last leg of our journey to the top of the waterfall. We realized that our best bet to observe the nesting vultures would be to get on to the ledge jutting out between the two waterfalls. To accomplish this we had to navigate a 1000 foot drop to the base of waterfall and a deep gorge. How we managed to do it God alone knows and the plants of Karvi (Carvia callosa) which provided us the much need support to hold on to our dear lives. But once on the ledge, the scene was spectacular. The landscape below was breathtaking and the cool breeze rejuvenated our spirits. Vultures glided below effortlessly and it was for the first time that I actually observed these giants glide below us. Some were collecting nesting material for a total of 4 nests that we counted and a total of 12 birds. The journey back was equally strenuous and at points we actually got to all our fours or clung on to rock faces. By the time we reached the Wilderness Resort, from where we had begun our journey, we were physically exhausted but our emotional state was one of triumph. Every bone and muscle in our body longed for rest and replenishment. That we had to travel another 70 odd kilometers to get back home on our 2-wheelers was not a very pleasant thought. That night as I & Nitesh slept in the comfort of our home, I experienced hallucinations for the first and the last time in my life. I had illusions of falling from the cliffs, slipping over rocks, missing my step and each time that happened I was rudely awakened from sleep. Though my body longed to sleep my sub-conscious was still wandering in the gorge of the Valvanti. The next morning I narrated my experience to Nitesh, who had a hearty laugh but not before admitting that he too had similar illusions. We followed this colony for over 4 years. Every monsoons they would migrate to escape the heavy monsoons in the Ghats and arrive back at the end of monsoons to start nesting. Every year their numbers dropped till 2009 when only one individual was sighted. This data was shared with BNHS and Peregrine Fund hoping for some conservation action on ground. No sign of the colony or any individual since has been seen in the locality. We only hope against hope that they have found a better place to breed and not met the fate that 99% of vultures all over the sub-continent have met. I & Nitesh meanwhile documented 3 more colonies, one of White-backed Vultures (Gyps benghalensis) and 2 of Long-billed Vultures in various parts of the neighbouring district of Sindhudurg in Maharashtra. Goa on the other hand has lost all its vultures and every time I see the Vajrasakala Waterfall, I am reminded about the last vultures that we could call our own.